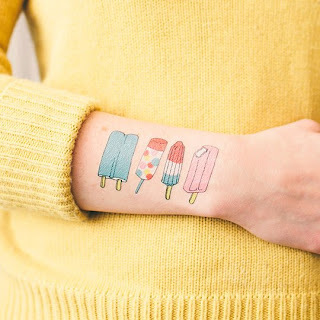 I need these temporary tattoos. I need them all over my body, all summer long!!! Sorry for the radio silence. We were in Montreal for two weeks celebrating my dad's 80th and while I had prepared two week's worth of blog posts ahead of time, when I got back, I had zippo blog entries and zippo energy. More to come soon including: shorts, pajamas, homeopathic medicine, box bags, kimchi, Montreal and whazzup in my garden.